“After a long and painful illness bravely borne”. William Bates grave is a registered CWGC grave with a personal headstone. William Bate attested in February 1916 and originally served with the Devonshire Regiment and in February 1917 worked for the Pay Corps. He transfered to the school of aeronautics at Reading in September 1917 and gained his commission in October 1917. His military record indicates that he was previously employed as a Photographer and the medical details showed that he had previously had a kidney operation, a carcenoma is recorded and it may be that he died from a reoccurance from this disease. 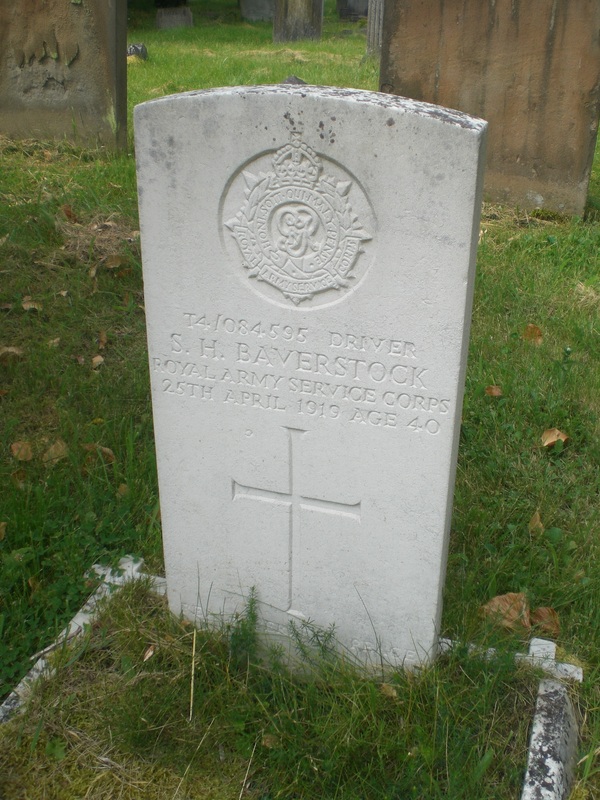 Sidney Herbert Baverstock died of wounds (gas) on the 25 April 1919. He was the husband of Annie M Baverstock of 116, Rupert Street, Reading. Sidney was born in Andover in 1878. Both the 1901 and the 1911 census have him living in Reading. In 1911 he was living in the same house as given at the time of the grave registration. He was father to three children, Dorothy 9, Herbert 8 and Mary 4 years. His occupation was given as biscuit mixer at Huntley and Palmers. The grave number is 6582 and has a CWGC headstone. 2nd/4th Battalion Royal Berkshire Regiment. The 2nd/4th battalion was formed in early September 1914 with men coming from all over Berkshire. Their first base was at Hitcham, in Buckinghamshire, on their commanding officers farm. The War Office could not spare any equipment and kit was supplied initially by the general public. In November they moved to Maidenhead from where some two hundred men were sent to the 1st/4ths in exchange for a draft of men who were not passed fit for general service or who had not volunteered for service abroad. Training at the time involved a good deal of route marching and drill. In December the battalion numbered one thousand and their first task was the guarding of German prisoners-of-war at Holyport. By February 1915 they were in Northampton, as part of the 2nd South Midlands Division, moving in April to Chelmsford where they dug trenches for the defence of London and patrolled the Essex roads looking for spies who might use lights to signal enemy aeroplanes. It was not until 25th May 1916 that the battalion finally left Southampton for France, ending up eventually at Merville near ArmentiÀres south of Ypres. After a short period of instruction in trench warfare attached to other battalions the 2nd/4ths took over trenches near Laventie. The battalion took casualties from their first days in the trenches and these gradually increased as the men were involved in carrying out patrols to investigate enemy wire and trenches. During the last week of June when the bombardment of the Somme was underway there was activity all along the British front line in order to keep the Germans guessing about where exactly the offensive would come. The 2nd/4ths were involved in such work loosing several junior officers and men before retiring to billets on 27th June. They went back into the front line on 6th July moving to Croix Barbee on 13th July. It was on this day that an elaborate raid on enemy trenches was carried out involving five officers and one hundred men. The objective was the capture prisoners, identification enemy units and the killing of Germans. Officers and men were divided into ten groups some men were carrying a Bangalore torpedo which would be used to blow a gap in the wire. The company set out at midnight and formed up, five yards between each line, in front of the British wire, in No-Mans Land. When all was ready the first wave moved forward, but reaching the German wire found only a partial gap. It was decided to use the Bangalore torpedo but by this time the Germans had observed the movements and were shelling No-Mans Land. The torpedo carriers were wounded in the shelling and the fuse lost. Four or five machine guns opened up as the first wave cut through the wire by other means and “gallantly penetrated the enemy’s first line under severe opposition”. (Commanding Officers report) The rest of the raiding party lost touch with the first wave and in a short time the signal was given for recall. Three officers were wounded and two killed: six men were killed and eleven recorded as missing, fifteen men were wounded. 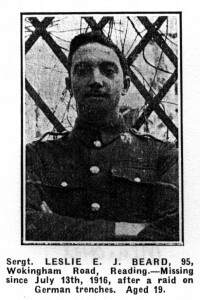 Leslie Beard was one of the missing and his name is recorded on Panel 93 the Loos Memorial to the Missing sited around the Dud Corner Cemetery. 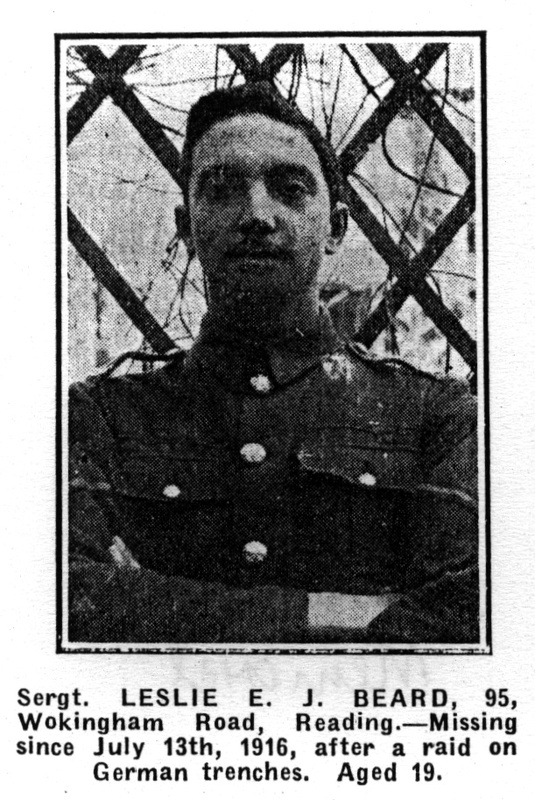 Leslie was the son of Joseph John and May Beard of 95, Wokingham Road, Reading. His name appears on both the Alfred Sutton School and the Park Church memorials. He was 19 years old.